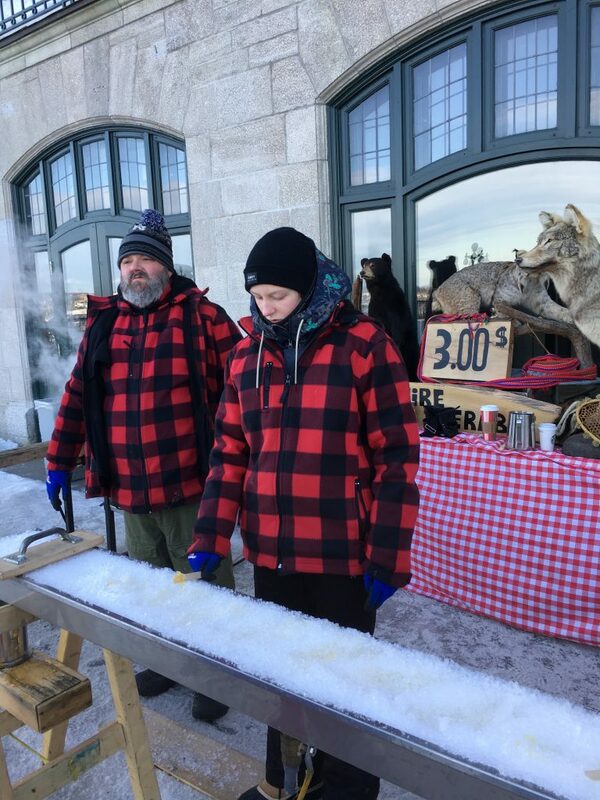 Outside the Ice Hotel in Quebec. 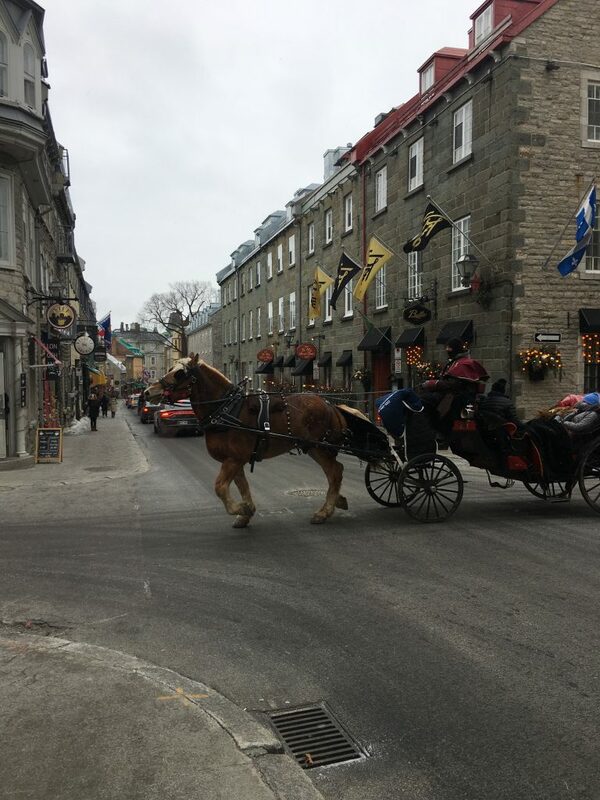 Canada has become a go-to destination in warm weather due to its beauty (hello, waterfalls, hiking trails and quaint cities) . 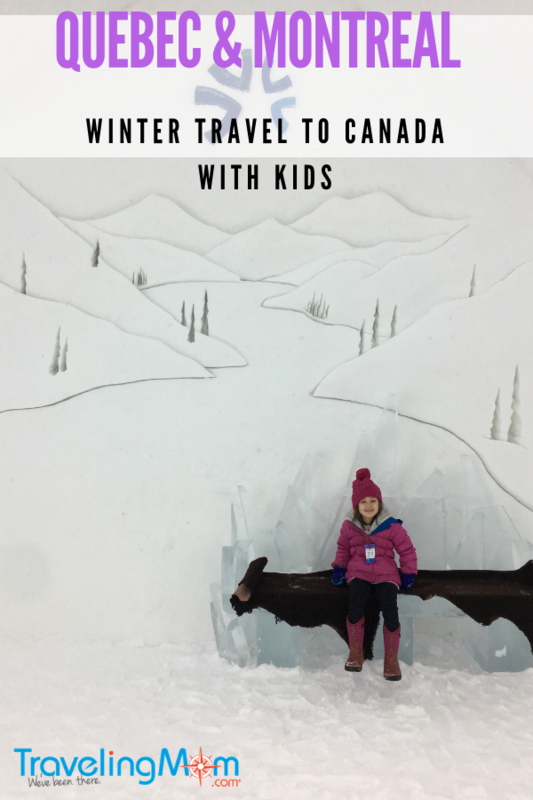 . . but to experience Canada during the winter months is to enter a new winter wonderland, complete with ice hotels, tubing excursions and maple taffy. 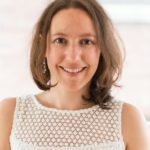 Before heading to Quebec and Montreal with my husband and two tweens over winter break, I was a little worried. We had an entire suitcase packed with snow pants, boots, scarves and long underwear. Was I going to be dealing with two whiny tweens who refused to leave the hotel room due to the weather? Fortunately, I couldn’t have been more wrong. 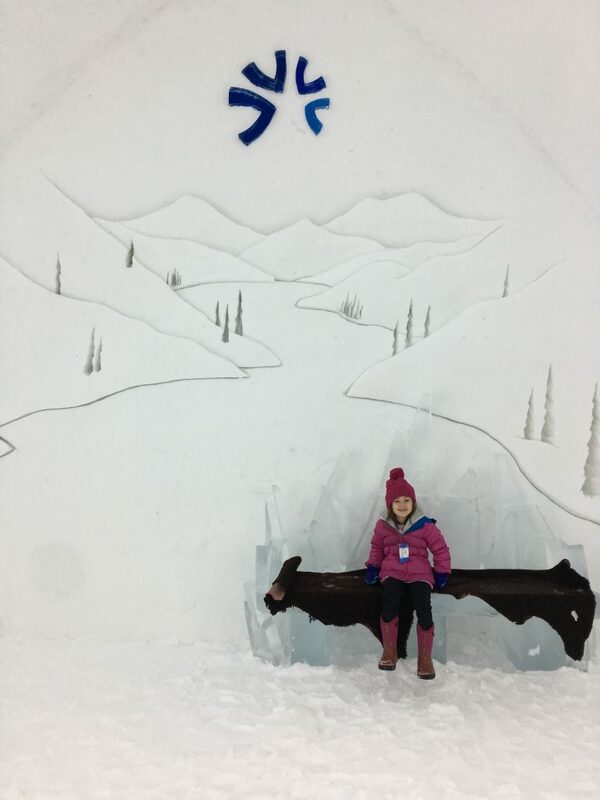 Lured by ski slopes, tubing mountains, iced maple candy and more, this was their favorite vacation yet. Yes, it’s an actual ice hotel. No, we didn’t stay there (though you can, technically). Instead, we visited the Hotel de Glace and experienced the best parts: dancing in the ice bar, drinking a shot of soda out of an ice glass and sitting on ice benches. The entire ice hotel is made out of . . . well, ice, and it was cold yet fascinating. It’s something you need to experience once in your life. 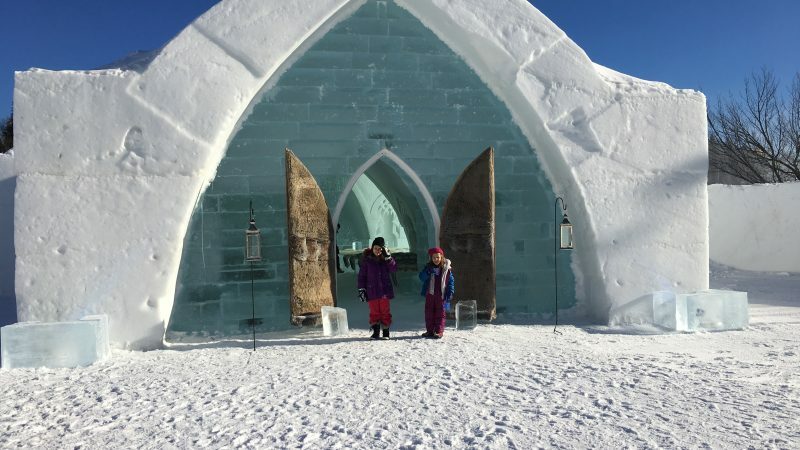 At the Hotel de Glace is an entire winter playground. It was my kids’ favorite part of the trip. There are more than 35 tubing slides, which are steep, scary and totally exhilarating. Imagine a water slide made out of snow, upon which you place your tube and go for a ride. You’re picturing the winter playground. They even had tubing lifts so you wouldn’t have to climb back up the mountain with all your gear. Here’s the deal. You’ll have to wait on a long line. You will freeze on that line. You will think you should not have waited on this long line for a slide. But when you climb those stairs to the toboggan with what remains of your frozen feet, you will feel so #blessed that you convinced yourself that frostbite was worth it. Because it is. 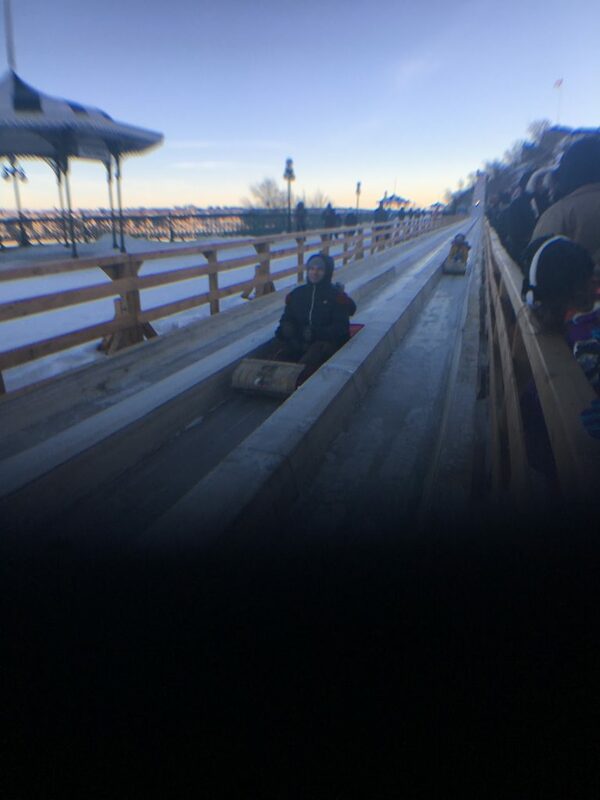 Besides the views from the top of the Toboggan (we apologize for the lack of photos from the top, as the cold froze everything including our camera by then), you will get to experience one of the craziest, fastest slides ever. It’ll all be over in a matter of seconds, but it’s those seconds that you’ll remember forever. 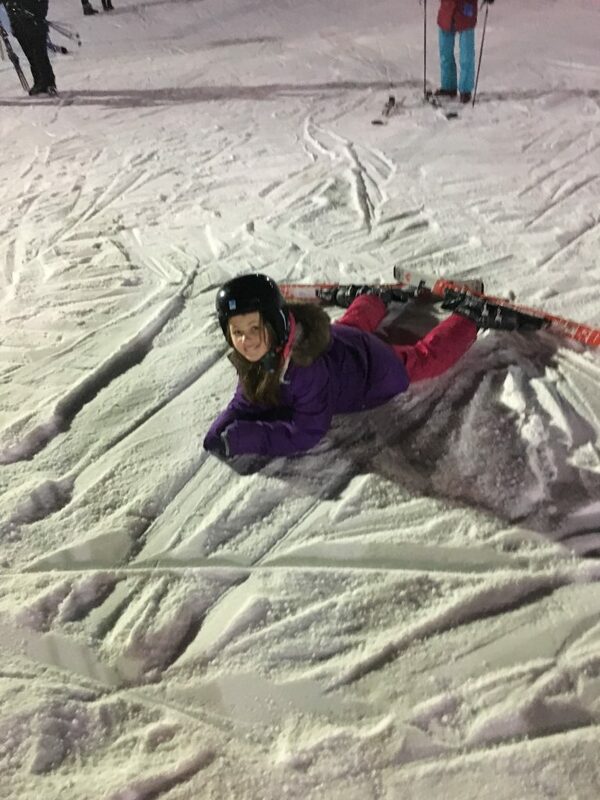 Full disclosure: I haven’t skied in about 20 years, and this was my children’s first time. I envisioned broken arms, stretchers, ambulance rides and more – but I felt like I owed it to my family to take them skiing if we were in Canada. The resort looks impressive, with lots of mountains filled with bumps (probably for the more advanced skiers?). But the ski resort wasn’t deterred by my lack of skiing knowledge – the instructors didn’t even seem to mind so much that I couldn’t figure out how to put on my boots. But the resort instructors weren’t deterred by my lack of skiing knowledge. They didn’t even seem to mind so much that I couldn’t figure out how to put on my boots. Once we were paired with a private instructor, we were off. In just an hour, he taught us how to ski. We may not make it to the Olympics, but I can safely say that we all made it down the mountain solo, and that’s a huge deal. No broken bones, either. If we were ever offered the opportunity to be on Food Network’s The Best Thing I Ever Ate, we would have to provide them with maple taffy. It’s so simple: just take fresh Canadian maple syrup, boil it, then immediately freeze it on fresh snow around a popsicle stick. Then eat. It’s sweet, cool yet warm, chewy, melt-in-your-mouth deliciousness, and most of the street vendors sell it for a few dollars. Unlike Quebec, which could be Switzerland’s little sis, Montreal is more like Chicago: it’s a nice big, clean city with great public transportation (ditch the car for this city). It’s got great museums and the restaurants are out of this world. This massive ferris wheel takes you high above the city, and you’ll have views of just about everything. Plus, it’s warm and cozy and gives you a 15-minute break to rest before heading out again. Sure, you can see the Cirque du Soleil just about anywhere now, but Montreal is where this circus got its start. And despite having seen it just about everywhere, we were treated to the best Cirque du Soleil performance yet at this location. So it’s worth it for sure. My children didn’t want to leave this centrally-located hotel. Why? Because the hotel had a gratis heated outdoor pool. Yes, they went swimming outside when it was freezing. And I let them because they loved it and I could relax with a cup of coffee in the hotel lobby and relax while they swam for hours every day. This free museum is a true gem. I loved that they had a sampling from just about every genre, which kept the kids’ attention since it kept changing every few steps. I don’t like bugs. But this was one super cool museum, especially for kids. 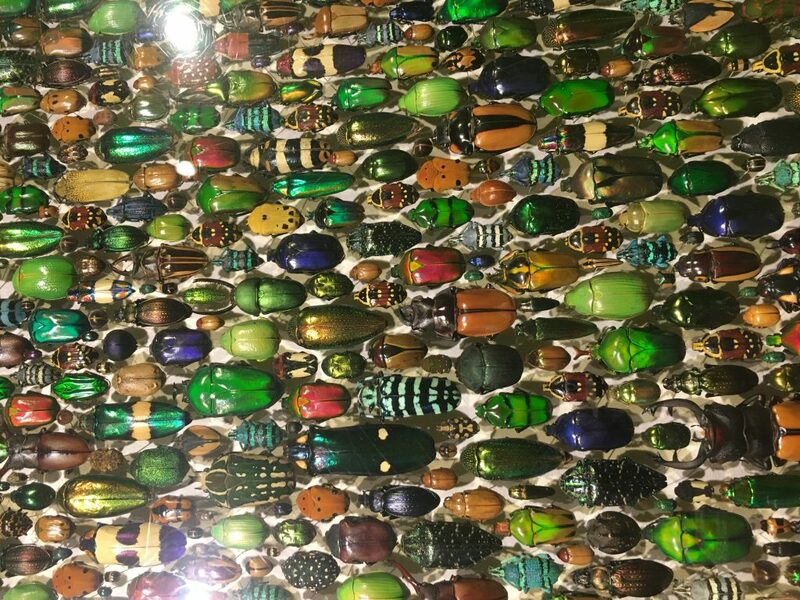 They had every type of bug imaginable, and they were oh-so-beautiful (who would have thought?). The museum is housed adjacent to the Planetarium, but we’d skip the latter and spend more time at the Insectarium, which is much more impressive. Previous Post: « Northwoods of Wisconsin in Winter: Greetings from the Polar Vortex!